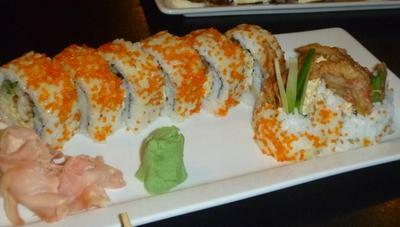 I'd been hearing and reading impressive reviews about Oishii Sushi Bar far too long. I'd been wondering and meaning to go and inexplicably opting for sad homemade omelettes instead. This weekend I finally made it to the restaurant deemed among the best sushi places in Brisbane. We were seated promptly around 6.30pm on a Saturday night, and shortly after placing our order, saw the succession of dishes laid hot before us. All were presented beautifully, garnished with mayonnaise and served with sides of ginger and wasabi. The kitchen is in plain view, proof that everything is made fast, fresh and by capable food wizards. Between four female diners, the five selections we ordered fed us sufficiently and saw us a pay just over $10 each. Oishii has over 60 items on the menu including curry, noddle, rice and dessert dishes in addition to a variety of traditional and contemporary fushion sushi. We enjoyed Tempura Sweet Potato (potato's younger, more attractive sister in a fried, crispy batter) and Teriyaki Chicken and Avocado Rolls, but undoubtedly the finer dishes of the evening were the creative sushi we tried. As a mild lover of seafood and exotic flavours, I was wowed by the Spider Rolls (soft shell crab, cucumber and a fishcake mixture wrapped in seaweed, covered in rice and tobiko), Himawari (deep fried chicken, avocado paste and a seasoned egg rice filling wrapped in omelette) and Takoyaki. I'm not a terribly adventurous diner and had I gone alone I would not have had the pleasure of trying the Takoyaki AKA Octopus Balls AKA octopus and vegetables encased in an egg batter. The flavour and texture of the Takoyaki made them the highlight of my meal and a must for future visits. The decor is simple and homely, and the staff are a lovely bunch providing quick and courteous service. Although we were seated immediately, the Sushi Bar and Restaurant is very popular and indoor and outdoor areas fill up quickly. You may have to wait 10 or 15 minutes during peak times. Alternatively, place a reservation by phone or email. Oishii is not open Mondays and close shop after the lunch rush (11.30am-2.15pm) and reopen for dinner at 5.30pm. I advise parking in the adjacent Pinelands Shopping Centre as the restaurant's parking spaces are limited.